Issue 6.10 is now online! The October issue of Methods is now online! This month’s issue contains two Applications articles and one Open Access article, all of which are freely available. – letsR: A package for the R statistical computing environment, designed to handle and analyse macroecological data such as species’ geographic distributions and environmental variables. It also includes functions to obtain data on species’ habitat use, description year and current as well as temporal trends in conservation status. – Cleaning Oil from Seabirds: The authors assess the efficacy of sea water as an alternative to fresh water for cleaning oil from seabirds’ feathers. Results indicate that for oiled feathers, a sea water wash/rinse produced clean, low BAI/unclumped feathers with minimal particulate residue. Stefano Canessa et al. provide this month’s only Open Access article. In ‘When do we need more data? A primer on calculating the value of information for applied ecologists‘ the authors guide readers through the calculation of Value of Information (VoI) using two case studies and illustrate the use of Bayesian updating to incorporate new information. Collecting information can require significant investments of resources; VoI analysis assists managers in deciding whether these investments are justified. The authors also wrote a blog post on VoI which you can find here. Our October issue also features articles on Niche Modelling, Population Ecology, Spatial Ecology, Conservation, Monitoring and much more. To begin the October issue, we have a forum article from Peter Stoll et al. titled ‘Effect sizes and standardization in neighbourhood models of forest stands: potential biases and misinterpretations‘. Effects of conspecific neighbours on survival and growth of trees have been found to be related to species abundance. Both positive and negative relationships may explain observed abundance patterns. Surprisingly, it is rarely tested whether such relationships could be biased due to transforming neighbourhood variables or influences of spatial aggregation, distance decay of neighbour effects and standardization of effect sizes. The authors argue that tests using randomized tree positions and identities provide the best benchmarks by which to critically evaluate relationships of effect sizes or standardized regression coefficients with tree species abundance. This month’s cover image shows flashes in the deep ocean, a mosaic of Myctophids (lantern fish) bioluminescing in the dark. Lantern fish are common, taxonomically-diverse and widely distributed, small (<15 cm) mid-water fish. They are major components of the deep-water community, and aggregate into discrete layers. These layers are readily detected with echosounders, and are known as Deep Scattering Layers (DSLs). Echo’s from DSLs can be so intense that they have been mistaken in the past for the sea-bed – the so called false bottom. Lantern fish contribute substantially to the millions of tonnes of biomass in DSLs. They play an important role in the transport of carbon and nutrients between the surface and the deep ocean via diel vertical migration, the largest known migration of biomass on the planet. The article related to this image, ‘A method for identifying Sound Scattering Layers and extracting key characteristics‘ by Proud et al., provides a much needed method to identify and characterise the ubiquitous layers, setting out well-defined metrics to enable inferences to be made concerning the spatial arrangement, distribution and heterogeneity of the biological community. The methodology will enable standardised and reproducible utilisation of a wealth of acoustic data that already exists, enabling us to gain better insight into ocean ecosystem function. 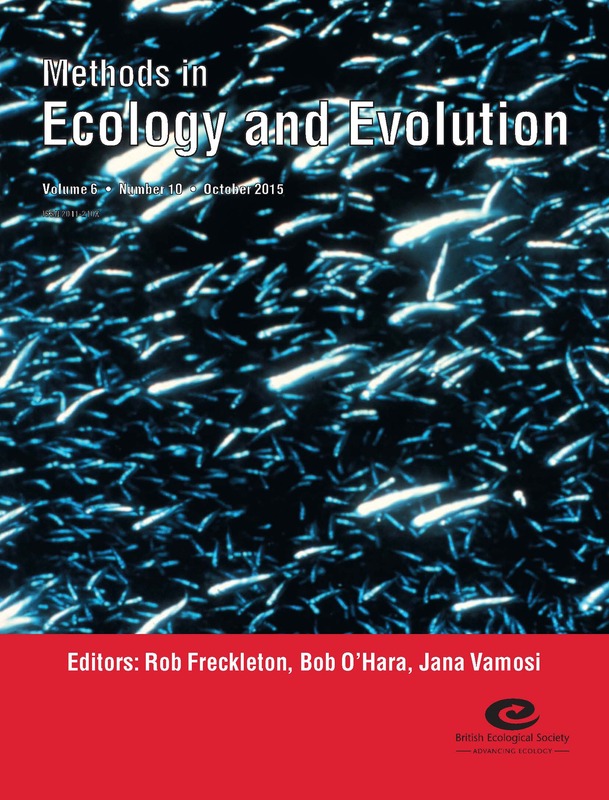 This entry was posted in Journal updates, Methods papers and tagged conservation, Deep Scattering Layers, ecology, Effect Sizes, evolution, Forest Stands, Lantern Fish, letsR, methods, monitoring, Myctophids, Niche Modelling, Oil Spill, open access, Population Ecology, Seabirds, Sound Scattering Layers, Spatial Ecology, Value of Information by Chris Grieves. Bookmark the permalink.